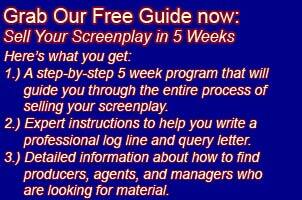 Getting your screenplay to production companies is actually a lot easier than most people think. It’s really as simple as getting the production companies address, email, phone number, or fax number and pitching your script idea to them. Most of the time you’re going to be politely turned down or dismissed out of hand but once in a while you will get through and someone will agree to read your screenplay. Please keep this in mind: rejection is going to be the overwhelming result (98% of the time in some cases – this is normal!) of what I’m about to tell you so please prepare for it and do not get discouraged by it. Now you should have several solid scripts and you should have written a nice query letter to pitch them. If you don’t have both of these things don’t start submitting your script. Submitting before you’re ready will be a waste of your time as well as anyone reading your query letters so don’t do it until you’re ready. People will remember you so make sure you are ready to make a good first impression. All you need to do now is prepare a list of production companies. To be clear (in case you skipped my other articles), you’re submitting a query and a short synopsis to these production companies which will hopefully result in them requesting the full script from you. Never send the full script first. There’s really no point in blasting out thousands of scripts when most of the time the company won’t want to read it anyway. Luckily The Hollywood Creative Directory (HCD) publishes a frequently updated list of virtually every production company in Los Angeles and New York, usually with address information, email addresses, phone numbers and fax numbers so all you need to do is purchase a copy and start submitting. You can purchase the HCD at Amazon by clicking here. Online you can buy a one week trial membership fairly cheaply – and during that week you should be able to go through every company and copy and paste the information into a spreadsheet for later use. You can also buy a hard copy from Amazon by clicking here if you prefer to own it. Keep in mind it does change quite a bit so if you do buy it you’ll want to buy a new copy at least once a year so that you’re always using the correct information when submitting. You need to get all the companies’ information into an excel spreadsheet so that you can easily and quickly send out mass mailings. If this means keying it in by hand, that’s what you’ll need to do. If this means getting your friends to help you, that’s what you should do. There are a lot of companies in the HCD so this is going to take a little while. You can also buy a digital version of the HCD which will allow you to copy and paste it into an excel spreadsheet much quicker – however the digital version costs over $300. If your time is very valuable this is a good way to do it although certainly not the cheapest. In the HCD it will typically list a few credits that each company has recently produced. I’ve read on other blogs and how-to books about looking through this and trying to find “good matches” for your material but I highly recommend NOT wasting your time with this. When I’ve submitted to companies I’ve never found any real correlation between a companies’ credits and what they were willing to read. In fact, I’ve worked for companies listed in the HCD and I’ve asked the heads of development about this and they usually all say that they’re interested in good material and don’t usually care too much about genre. Once you have all this information in an excel spreadsheet you can actually use it 2 or 3 different times over the course of the next year or so it’s a good investment in time. Over the years I’ve had the best luck in terms of response rates when I sent a letter through regular mail to a production company. Typically I can get a “we’ll read your script” response from letters about 5% to 10% of the time. While this method is very costly (one stamp per letter plus envelopes and paper) it does seem to produce the best results. Once you have all the contact information in an Excel spreadsheet you can actually use MS Word’s Mail Merge function to pump out all the letters with the proper heading and address on it. Tip: while it may be very time consuming hand write the addresses on all the envelopes when you send them out (get friends to help). I’ve seen a nice jump in the response rate with handwritten names and addresses on the envelopes. I think this is because printed labels, while easy, look more like junk mail and may get discarded before even being read. After letters through regular mail, I’ve found that faxing a query letter to a company usually results in about a 5% positive response. This is probably the way to go. Using a service like FlatRateFax.com you can send out a fax to all the companies in your database in seconds and for relatively little, too. Again, once you have your letter written you can upload your Word doc and your Excel spreadsheet of addresses to FlatRateFax.com and they will merge the documents and send out the faxes to all the fax numbers in your spreadsheet. It takes a little bit of time setting up the files properly, but once you’ve done it you can blast out query letters in next to no time and for a pretty reasonable price, too. Email is the easiest and cheapest way to send out query letters, but I’ve found that my response rate suffers, too. If you can get a positive response rate anywhere near 2% of the time you’re probably doing pretty well. In today’s world of spam filters I’m sure a large number of these emails don’t even get read. Check out my post Submitting Your Screenplay Via Email – How To Create A Catchy Subject Line for some tips on how to write an effective subject line. I have never tried cold calling production companies mainly because I’m not a good salesman. I have had friends try this method and it is by far the most effective. If you can stomach it you should try it. Pick out a few smaller production companies and call them. Pitch your idea and try and get them to agree to read your script. Keep careful notes so if someone is friendly and receptive to your ideas you can call them back after you’ve sent the script to try and get any notes they’re willing to offer. As you can tell from the different methods I recommend you’re going to get turned down a lot – in fact the vast majority of the time. Do not let rejection slow you down. Not even a little. I don’t. Any success I’ve had optioning and selling scripts is a direct result of me plowing forward even in the face of mountains of rejection letters. I would recommend starting out with 100 letters through regular mail to gauge the effectiveness of your query letter and synopsis. Once you start to get close to 5% of your queries getting a “yes” response then you can step it up and start to do mass fax blasts. By only doing 100 letters at a time you won’t be alienating lots of producers with half backed ideas. If you can’t get roughly (i.e. at least 3) “yes” responses out of 100 letters you’re not ready for a massive campaign. You’ll need to take a long hard look at your query letter and synopsis and rewrite them. Try again with another 100 letters and measure results again. Rewrite and try again. And just keep trying until you’re getting some producers to read your scripts. One word of warning: The ideas I’ve purposed above should not be used if they violate any local or state laws which they very well might since these emails and faxes may be considered SPAM. Most areas have laws forbidding SPAM and by sending unsolicited material to a company you may very well be spamming them. I’ve never had any problems; however, you should consult with a lawyer if you have any questions about the laws in your area.